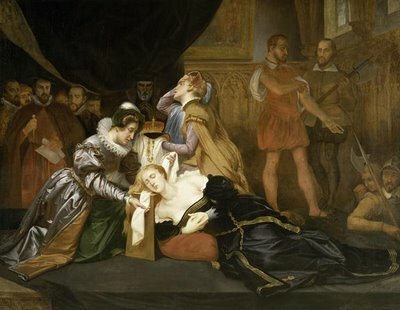 Her [Mary queen of Scots] prayers being ended, the executioners, kneeling, desired her Grace to forgive them her death: who answered, ‘I forgive you with all my heart, for now, I hope, you shall make an end of all my troubles.’ Then they, with her two women, helping her up, began to disrobe her of her apparel: then she, laying her crucifix upon the stool, one of the executioners took from her neck the Agnus Dei, which she, laying hands off it, gave to one of her women, and told the executioner he should be answered money for it. Then she suffered them, with her two women, to disrobe her of her chain of pomander beads and all other her apparel most willingly, and with joy rather than sorrow, helped to make unready herself, putting on a pair of sleeves with her own hands which they had pulled off, and that with some haste, as if she had longed to be gone. Then she, being stripped of all her apparel saving her petticoat and kirtle, her two women beholding her made great lamentation, and crying and crossing themselves prayed in Latin. She, turning herself to them, embracing them, said these words in French, ‘Ne crie vous, j’ay prome pour vous’, and so crossing and kissing them, bade them pray for her and rejoice and not weep, for that now they should see an end of all their mistress’s troubles. This done, one of the women having a Corpus Christi cloth lapped up three-corner-ways, kissing it, put it over the Queen of Scots’ face, and pinned it fast to the caule of her head. Then the two women departed from her, and she kneeling down upon the cushion most resolutely, and without any token or fear of death, she spake aloud this Psalm in Latin, In Te Domine confido, non confundar in eternam, etc. Then, groping for the block, she laid down her head, putting her chin over the block with both her hands, which, holding there still, had been cut off had they not been espied. Then lying upon the block most quietly, and stretching out her arms cried, In manus tuas, Domine, etc., three or four times. Then she, lying very still upon the block, one of the executioners holding her slightly with one of his hands, she endured two strokes of the other executioner with an axe, she making very small noise or none at all, and not stirring any part of her from the place where she lay: and so the executioner cut off her head, saving one little gristle, which being cut asunder, he lift up her head to the view of all the assembly and bade God save the Queen. Then, her dress of lawn falling from off her head, it appeared as grey as one of threescore and ten years old, polled very short, her face in a moment being so much altered from the form she had when she was alive, as few could remember her by her dead face. Her lips stirred up and down a quarter of an hour after her head was cut off. Then one of the executioners, pulling off her garters, espied her little dog which was crept under her clothes, which could not be gotten forth but by force, yet afterward would not depart from the dead corpse, but came and lay between her head and her shoulders, which being imbrued with her blood was carried away and washed, as all things else were that had any blood was either burned or washed clean, and the executioners sent away with money for their fees, not having any one thing that belonged unto her. And so, every man being commanded out of the hall, except the sheriff and his men, she was carried by them up into a great chamber lying ready for the surgeons to embalm her.